Hydraulic bedrock frost heave is an unusual process that can occur when pressurized groundwater underlies frozen bedrock. The concept is most plausible when a rapidly cooling climate allows glacially pressurized groundwater to remain unfrozen at depth, even as near-surface rock and ice layers are cooled well below the freezing point. In many respects the processes underlying hydraulic bedrock frost heave resemble the processes leading to the formation of open-system pingos in frozen soil. 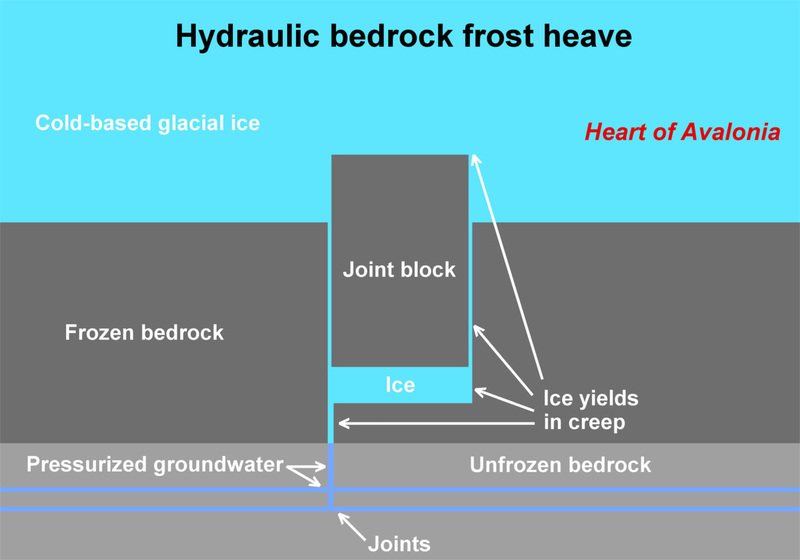 The illustration above shows "pure" hydraulic bedrock frost heave, that is, it shows a frost-heave process unaided by ice segregation or water expansion upon freezing. As such, the illustrated hypothetical process uses no energy extracted from a thermal gradient and instead uses only mechanical energy imparted by groundwater pressure (ultimately, gravitational potential energy). Hydraulic bedrock frost heave is therefore a key indicator of an artesian bedrock aquifer. In many situations, bedrock frost heave that has a hydraulic component would be aided or dominated by a thermal process such as ice segregation. However, under thick glacial ice, thermal gradients diminish rapidly with increasing depth, leaving more room for hydraulic effects to dominate. The hydraulic bedrock frost heave process thus becomes the preferred explanation for bedrock frost heave occurring under substantial thicknesses of glacial ice. It should be noted that hydraulic bedrock frost heave cannot occur in the total absence of a temperature gradient. Groundwater moving toward the surface must freeze before it can exert significant force on the surrounding rock. Freezing of water implies removal of the heat of crystallization which, in turn, implies a temperature gradient. The key distinction between hydraulic bedrock frost heave and frost heave driven by ice segregation lies in the primary energy source, mechanical energy in the case of the hydraulic process, heat energy in the case of the ice segregation process. One indicator of hydraulic bedrock frost heave in field observations would be the lifting of a frost-heaved joint block completely clear of the substrate, leaving an empty hole in otherwise intact bedrock. Further evidence of hydraulic frost-heave action taking place under glacial ice is found when a displaced frost-heaved joint block is relocated horizontally along a recognized direction of ice flow. Hydraulic bedrock frost heave could theoretically occur under temperate glacial ice, where the inverse process to pressure melting (pressure-reduction freezing) allows liquid water to freeze underneath a joint block. This process, resembling plucking, would require a stabilized 0 deg. C temperature environment and would function under 10's of metres or more of glacial ice. Under thin glacial ice in cold-weather conditions or under thick cold-based glacial ice, the hydraulic process could work well, but would be rate-limited by the low velocity of ice creep along narrow channels. However, since the total rock displacements associated with bedrock frost heave are small (typically only cm or 10's of cm), even low-rate creep would be sufficient to produce significant frost-heave features after years or decades of activity. In summary, hydraulic bedrock frost heave is a less common process that may seldom occur in its pure form. However, when under-ice bedrock frost heave is inferred, a partial or total hydraulic process becomes a plausible, if not preferred, explanation. Identifying hydraulic bedrock frost heave in the field can provide evidence of linkage to past episodes of abrupt climate change.